Cardstock is Bazzill and patterned paper is from Recollections. The snowmen came from a stamp from Hampton Arts and were colored in using gel pens. I added some Rock Candy stickles to the snowmen and snow drifts that I fussy cut. I added some B00 copic marker to my white snowflake brads to tie it all in together. 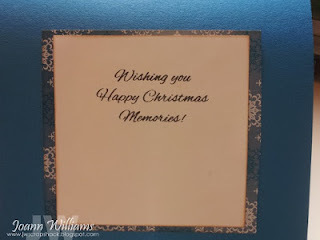 The sentiment is from Cardz TV's Stamps "Christmas Joy" set. Below is a picture of the inside which uses another sentiment from this stamp set. Well thats all I have for today my friends. Please check out what my Design Team sisters created for this challenge and link up your own creation for a chance to win some awesome stamps by Mary with Cardz TV! Also make sure you become a follower to my blog and enter HERE for my 200th follower giveaway! Gorgeous card! I love how you did the scenery for this one as it looks all 3d, and that background paper is just perfect for those snowmen. Great job! How pretty. I love your little snowman scene, Jo, and the fabulous sparkle you added. Great cards love the paper you selected Jo! So pretty! Your snowmen are so cute! I love this card! Great job! I love this card! Stunning combination of blue and white! 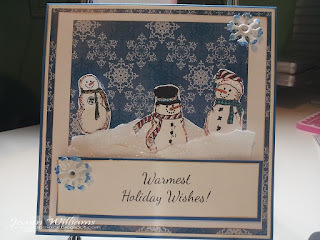 What a Beautiful card!Love the sparkely Snow & Adorable snowmen!! 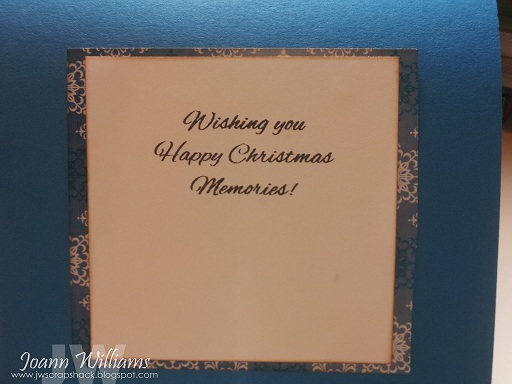 Absolutely beautiful card Jo! Soft blues and whites are one of my fav color combinations. I love the blues and whites. This is a perfect winter card. Saw your card on Cardz TV...it's just adorable! LOVE those cute snowmen. Such a great little winter scene! Hi Jo! Really great card here. I LOVE the detail you put on the edges of the snowflakes!